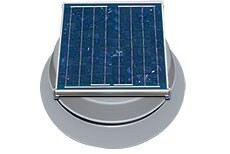 Solar Attic Fan with 24 Watt Panel operates at 1275 cfm in full sun and can vent up to 2000 sq. ft. The Solar Attic Fan is a simple and environmentally sensible solution that can save you money. Powered completely by free solar energy, this sleek and efficient vent is both compact and quiet. Fully operational right from the box, it installs easily, with no electrical wiring, no expensive electrician and city permits. And let's not forget powerful! Operating at a whopping 1275 cfm in full sun, a single solar attic fan unit can vent up to 2000 square feet. Place it wherever you need improved circulation: attics, lofts, workshops, storage sheds, garages, even barns. Minimize backpressure of exhaust gases. Natural Light Energy Systems Solar Attic Fan incorporates an angled throat within the flashing design that provides a venturi effect, increasing airflow. The Natural Light Energy Systems Solar Attic Fan was designed from the ground up to minimize obstructions in the flashing and shroud. Maximize the exposure of the sun to the solar panel. The Natural Light Energy Systems Solar Attic Fan is designed with an adjustable mounting bracket which holds the solar panel that allows for angling the panel for maximal exposure to the suns rays. The mounting bracket also allows for remote mounting of the solar panel and for optimal panel / flashing placement on any roof. Minimizes the ambient temperature of the solar panel: Because power output of any solar panel rapidly declines as temperature increases, having air circulating around the panel gives the best performance possible. By adjusting the panel up off the lid, the solar panel mounting bracket allows for an envelope of cool air to continually circulate around the entire solar panel! Natural Light also powder coats the entire solar attic fan assembly in a neutral gray color ensuring that the lid of the solar attic fan does not act as a heat sink which would increase the temperature of the solar panel. Adaptable to any location, roof type, in any environment. Venting reduces heat build-up on your roof shingles and underlayment. In hot summer months, an attic vent saves money on your electric bills and reduces wear on your AC unit. In cold winter months, attic air circulation slows the snow melting on the roof and refreezing as ice at the eaves. Attic fans reduce vapor buildup generated by every day activites such as showering and cooking. Powder coated to withstand any environment. Fifty year Neutral Cure silicone bonds the flashing to the roof. Thanks to the industry's leading manufacturers of solar panels (BP), low voltage DC motors and the use of high quality materials and precise construction techniques employed by Natural Light, the solar attic fan is covered by an industry leading 25 Year Warranty on the housing and panel, 10 years on the motor.